"Thinking is the hardest work there is, which is why so few engage in it - Henry Ford"
Your personality is very important to the type of job you should do! Employers have been using personality tests with their (potential) employees for years. These tests help them determine whether they are the right “fit” for the company, the job etc. Employers use them to measure (among other things) whether you prefer working in a group or independently. Or whether you prefer taking charge over situations, or following others. We need to have a little light-hearted look at your personality here! Many personality characteristics are listed below. Each one ranges from one extreme to the other. For each one, mark with an ‘X’ the spot where you think your personality lies. NOW, for each one, GO BACK AND MARK (with a tick) WHERE YOU WOULD LIKE TO BE. Is there much difference between what you ARE? and what you WANT to be like? For those characteristics where there is a significant difference, do you want to change? Is it possible to change? Could you “change” your personality to suit certain situations? In what situations is this most likely to be useful to you? 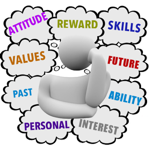 What have you learned about yourself which might help you with your career decision? Can you name the particular personality characteristics which might be important in each of these jobs? Can you think of other examples of jobs where you need to have certain personality characteristics to do the job properly? Why do you need those characteristics? Your attitudes could have an effect on the type of job you choose. BACK to Choosing a Career index.